Baisakhi Festival celebration marks the birth of Khalsa Panth (Religion) way back in the year 1699. Read further for legends and history related to Baisakhi Festival. Legends of Baisakhi Festival - The story of Baisakhi festival began with the martyrdom of Guru Teg Bahadur, the ninth Sikh Guru who was publicly beheaded by Aurungzeb, the Mughal ruler. Aurungzeb wanted to spread Islam in India and Guru Tegh Bahadur stood up for the rights of Hindus and Sikhs and the Mughals therefore saw him as a threat. After the dealth of Guru Teg Bahadur, his son, Guru Gobind Singh became the next Guru of the Sikhs. Guru Gobind Singh wished to instill courage and strength to sacrifice among his fellow men. To fulfill his dream, Guru Gobing Singh called on the historic Baisakhi Day congregation of Sikhs at Keshgarh Sahib near Anandpur on March 30, 1699. When thousands of people assembled for Guru's blessing, Guru Gobind Singh came out of the tent carrying an unsheathed sword. He gave a powerful speech to infuse courage among his fellowman. At the end of the speech he said that every great deed was preached by equally great sacrifice and demanded that anyone prepared to give his life come forward. On the Guru's third call, a young man offered himself. The Guru took the man inside a tent and reappeared alone with a bloodied sword. Guru Gobind Singh asked for another volunteer. This was repeated another four times until a total of five Sikhs had gone into the tent with the Guru. Everyone present was worried and though that Guru Gobind Singh has killed five Sikhs. At this point the Guru presented all the five men before the people. Every one present was surprised to see all five men alive and wearing turbans and saffron-coloured garments. These five men were called Panj Piara or 'Beloved Five' by the Guru. The Guru blessed them with a Pahul ceremony. In an iron vessel, the Guru stirred with a sword called Khanda Sahib, the batasha that his wife, Mata Sundari Ji has put into the water. The congregation recited verses from scriptures as the Guru performed the sacred ceremony. The water was now considered the sacred nectar of immortality called amrit. It was first given to the five volunteers, then drunk by the Guru and later distributed amongst the crowd. With this ceremony, all those present, irrespective of caste or creed, became members of Khalsa Pantha (the order of the Pure Ones). The Guru regarded the Panch Piaras as the first members of the Khalsa and the embodiment of the Guru himself. With the constitution of the Panj Pyare the high and low castes were amalgamated into one as among the original Panj Pyare, there was one Khatri, shopkeeper; one Jat, farmer; one Chhimba, calico printer; one Ghumar, water-carrier and one Nai, one barber. The Guru ggave the surname of Singh (Lion) to very Sikh and also took the name for himself. From Guru Gobind Rai he became Guru Goobind Singh. This was seen as a great step in national integration because society at that time was divided on the basis of religion, caste and social status. Guru Gobind Singh also bestowed on Khalsa, the unique Sikh Identity. He directed Sikh's to wear five K's: Kesh or long hair, Kangha or comb, Kripan or dagger, Kachha or shorts and a Kara or bracelet. 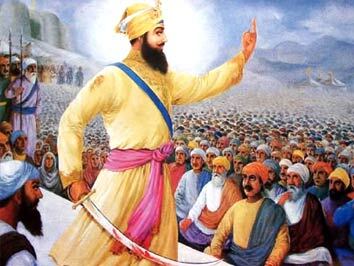 Guru Gobind Singh also discontinued the tradition of Gurus and asked all the Sikhs to accept the Granth Sahiib as their eternal guide.